Today is my first Blogiversary! Ahh, I can’t believe I have been blogging for a year now. It’s crazy to think that last year on this day I posted my very first post. Yes, I am going to start with the sappy stuff. Blogging has changed my life in so many ways. First it has connected me with so many wonderful people who share the same passion for baking I do. the blogosphere is so big, so I never imagined that I would be able to create so many friendships. Blogging has also been a wonderful stress reliever. I am the type of person who gets frustrated and upset easily. When I’m stressed out I put a brave face on, but from the inside I’m breaking into small pieces. Blogging has mitigated my stress, when I publish a post and get positive feedback my face lights up (I really love hearing from you guys). Lastly (but certainly not least), blogging has made me open minded; seriously if I hadn’t started blogging I would never find zucchini in brownies acceptable, my once provincial mind has opened up and it’s the best thing ever. If I had to choose my favorite thing about blogging it would be you lovely people. When I started blogging I thought my mom would be the only one reading (Hi Mom!). I often dreamed about other people reading my blog, and once other people did I couldn’t believe it. I mean real living breathing people find me interesting enough to read and sometimes even subscribe. So thank you! Your one like, comment, or view makes me happier than you know (Seriously I want to give all of you a cake). I know I have a long way to go and that my blog may never be at the caliber of some amazing blogs. But this little space on the corner of the web is mine (and yours) and I’m proud of that. And we’re done with the sappy stuff. Did I make you cry? 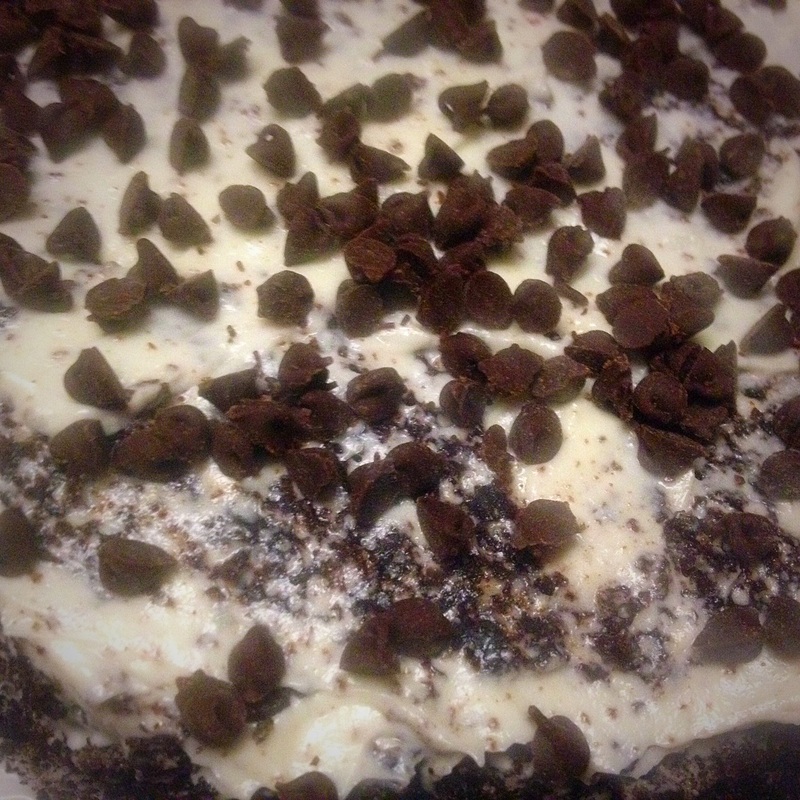 To celebrate such a big milestone I made a cake with a cheesecake center, so I could have the best of both worlds cheesecake and cake (and cookies)! Start by making cheesecake. Combine cheese, sugar, and vanilla. Once fully combined add eggs. Pour into springform pan, and bake in oven for 30 minutes or until center has set. Allow cheesecake to cool for 3 hours in fridge. While cheesecake is cooling, time to bake the cake. Pour everything into a bowl, except boiling water. Mix everything together and then add boiling water. Place in round pan (or two pans) bake in the oven for 30 to 35 minutes or until set. Once both cakes have cooled cut chocolate cake in half (or bake into separate pans at the beginning). Put cheesecake in the center of the two cakes. Frost cake with any frosting and decorate. You can use a chocolate cake mix, if you don’t want to make the chocolate cake from scratch. I put cream cheese frosting, but you can use any. 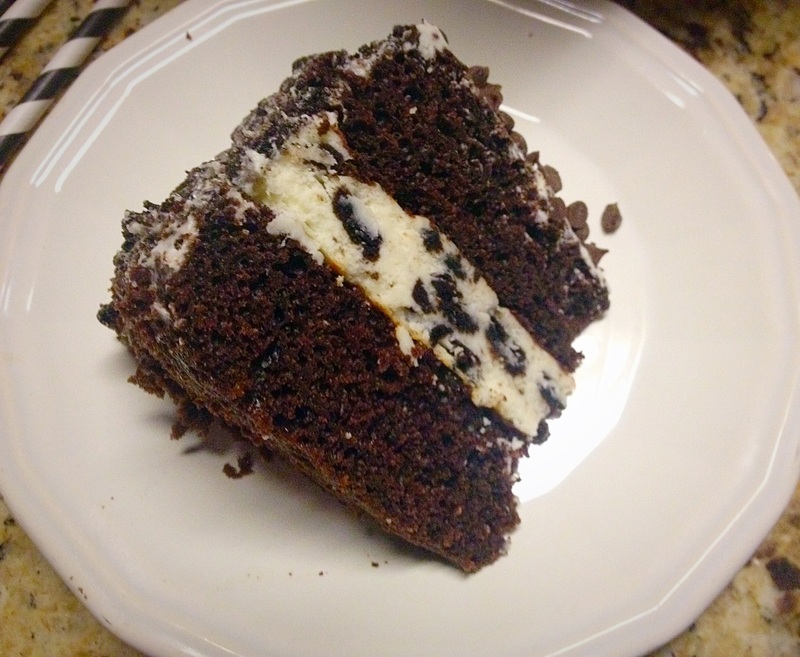 I decorated with mini chocolate chips and crushed Oreos. Congrats congrats! And cheesecake with chocolate will never go wrong! Yum! Very nice! Can I have another piece? Wow! Looking at this sinful chocolate cheesecake cake is making me drool! Also, happy blogiversary! !